Left to right: Eva Sajovic The Elephant’s Trumpet; Gemma-Rose Turnbull Free Photo Portraits; D. Wiafe, 4pm In The Endz; Wright & Vandame Never Far Away. The artists’ collaborative projects span a range of communities and contexts, from young people in Pollard’s Hill Estate; the customers, passers by and residents local to the Brixton Pound community cafe; tenants and customers of the Elephant and Castle shopping centre; to the residents and local community services of Railton Road. Collectively, all of the work on show expresses the points of view of the participants alongside the artists as together they used photography to represent themselves and the things that matter to them. 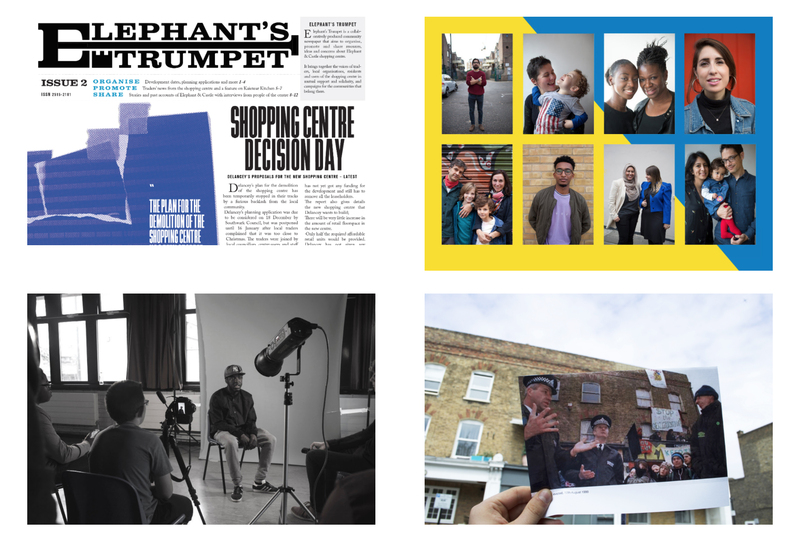 The Elephant’s Trumpet is a collaboratively produced community newspaper in Elephant & Castle that aims to organize, promote and share resources, ideas and concerns about Elephant & Castle Shopping Centre, at the heart of an area undergoing a massive regeneration. The newspaper brings together the voices of traders, local organisations, residents, local artists and users of the shopping centre in mutual support and solidarity. By making publicly available a selection of materials produced and documentation of the process of production (meetings, making, disseminating) this installation hopes to reach out, connect and share with other communities facing similar challenges. To create Free Photo Portraits Gemma-Rose Turnbull collaborated with Eliza Gregory to set up a temporary photographic studio in central Brixton. The portrait project aimed to explore what an over-represented community might want from photography, rather than engaging in traditional practices of outsider representation. Over four days in October, Gemma and Eliza, with assistance from Georgia Hutchins and Laura Dakin, photographed 77 people and one stuffed rabbit at Brixton Pound, on the site of the old Mr Biggs family portrait studio. Each participant left with the images made of them, and the final body of work represents those people who chose to take part. 4pm In The Endz is a collaborative project created with the young people of Pollards Hill, a housing estate in the borough of Merton. Inspired by a song written by local rapper Teks Sinatra, together with the artist D.Wiafe, young people from the area to explored the turn from day to night and the accompanying suspicion of criminal mischief that falls on the doings of the estates young inhabitants. Made over a six-month run of weekly workshops and presented in a mix of video, sketches and photography, the work questions the role that stigma, hearsay and truth have played in the representation of the area to those who reside within and the community outside. Josh Wright and Guillaume Vandame, collectively known as Wright & Vandame, were inspired to further understand the greater changes rapidly happening across London by focusing exclusively on one street. The artist duo were drawn to Railton Road and its history of radical political and social movements of the late 20th century. Through research and collaboration with current residents, the artists became interested in the theme of open and closed spaces, encompassing public spaces, which had lost local funding and become abandoned, alongside charities which lacked visibility of the invaluable services offered to the public. Never Far Away consists of photographs from these workshops and a selection of works created by the participants at Photofusion, as well as an offsite exhibition trail on Railton Road. The Taking Part residencies provided a foundation for residents to test ideas, work with community groups, and extend their participatory artistic practice. On the 10th March, we will host an artist led symposium to invite a wider audience to the conversation. We seek to expand on ideas explored in each of the resident projects through a panel event and a series of talks to engage with dialogues explored in the wider realm of participatory practice and socially engaged work. Further details about this event to be released soon. Tagged 4pm In The Endz, Anthony Luvera, Christiane Monarchi, D.Wiafe, Eliza Gregory, Eva Sajovic, Free Photo Portraits, Gemma-Rose Turnbull, Gina Glover, Josh Wright and Guillaume Vandame, Lizzy King, Never Far Away, participatory photography residency, Photofusion, Taking Part, Taking Part Talks, The Elephant’s Trumpet, Wendy Ewald, Wright & Vandam.